Could you kindly please assist with the following ERROR MESSAGE? 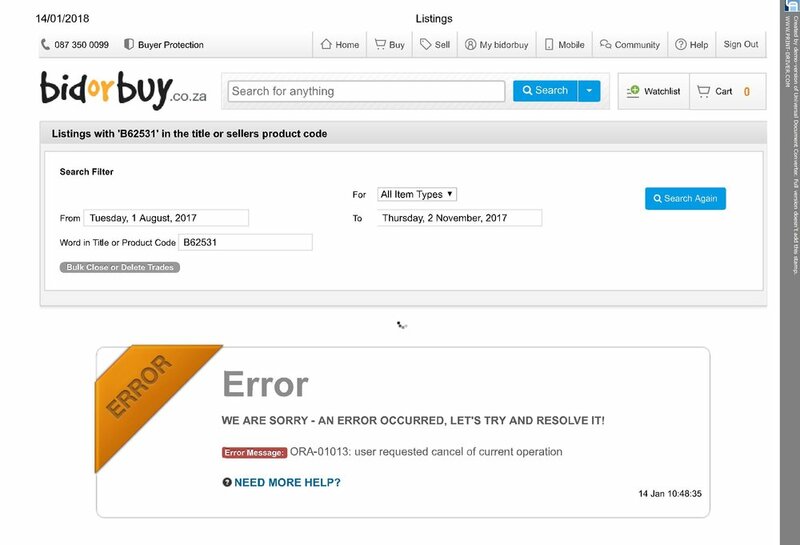 Each time I try and SEARCH back in time on my listings for a certain item on the STOCK CODE or even a "WORD" (Even just going back as far as August 2017) your system has been throwing this ERROR MESSAGE out to me for the past 7 days. I have tried clearing my CACHE, which has not helped, I have also re-booted my PC which does note help either. Kindly please look into this and assist with sorting this out for me. I have phoned BidorBuy numerous times with the promise every time that someone will call me back which to date has not happened. Really... where is the support when you need it? I sent this mail to hello@bidorbuy last week already and I am yet to get ANY response or assistance. This is very frustrating and time consuming when your system does not do what it is supposed to do.